There are, in my opinion, two clear messages after watching the new Disney movie Dumbo, in cinemas in Australia on March 28th. The first message is how important family are, which you are reminded of throughout the whole film. The second message you have to wait a while to receive, but it is worth the wait and I am so glad the pro-animal rights message comes through. I was left with a mixture of emotions (you do go on an emotional rollercoaster) and I would suggest taking plenty of tissues as you will shed a tear or two, but it a warm, brilliant adaptation (I would say over half of the movie is something new) of the original animated movie and will leave you wanting to watch the original to compare the two. The hype for this new movie will reinvent all things Dumbo, so be prepared for lots of merchandise to be released in the coming months. It is set in America in 1919 and follows circus owner Max Medici (Danny DeVito) with his struggling travelling circus. Medici buys a 'sick' pregnant elephant for a cheap price and he thinks his world has got a whole lot worse when the baby elephant arrives with massively oversized ears. He doesn't want to become a laughing stock, so sells the mum elephant and puts the baby elephant into the clown act. 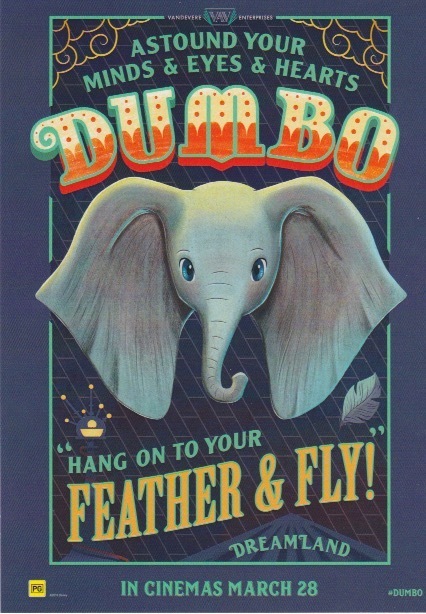 Two circus children befriend Dumbo (the movie explains how the name came about) and they discover his ability to fly with the supposed magic of a feather. The children promise Dumbo if his fabulous flying talent will bring in more numbers to the struggling circus, they will use that money to help find his mum. The promise of 'something you will never forget' and 'you have seen a horsefly, housefly and a dragonfly, but you have never seen an elephant fly' does bring attention to the Big Top, and so the story of the epic search and necessary rescue starts. There are lots of cute, adorable 'aah' moments and one of them is when you first see Dumbo. The computer graphic (CG) Dumbo looks great and the amazing likeness to real elephants is uncanny. Danny DeVito was a particular delight for me as he added some much-needed humour. The movie ends on a high and the second message is apparent. It is suitable for all ages and is worth just under two hours of your time.